When developing a weight lifting regimen, one of the major muscle groups that gets overlooked is the back. Most people get too preoccupied with developing a massive chest and bulging biceps to realize that one of the best ways to look toned and defined is to have a chiseled back (isn’t that what people are looking at when they walk behind you?). Have you ever looked at the size and witnessed the endurance of Olympic level rowers? Their physiques are a testament to the power of using rowing as a complete body workout. “Just rowing for 20 minutes per day is enough to develop more endurance and lose weight,” says John from Motocross Gear. You can accomplish this task easily by using a rowing machine or a cable bench with very little resistance. While rowing for cardio purposes is an excellent workout, to get more powerful lats you are going to need to add some resistance. BodyBuilding.com suggests exercises like seated cable rows, one-handed dumbell rows, and the leverage iso row to build up strength and add size to your lats. 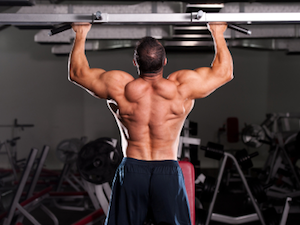 Pullups are one of the most classic and commonly practiced exercises for a reason. They not only workout the lats, but hit the upper back and biceps as well. All you need for this exercise is an elevated and stable bar. If you can’t perform a set of pull-ups right away, most gyms offer assisted machines that will decrease some of your own resistance. By getting on the lat pulldown machine and pulling weight towards your chest, your upper lats will become stronger. You can alter this workout and work different subsections of the lats by switching from wide-grip to close grip on alternating days. Before starting any resistance or cardio training routine, it is important to get the permission of a doctor and the advice of a personal trainer. It is also important to use the correct weights and the proper amount of rest. Not doing so could cause injury by not allowing the muscles to repair and heal correctly. For best results, perform this workout once or twice a week.